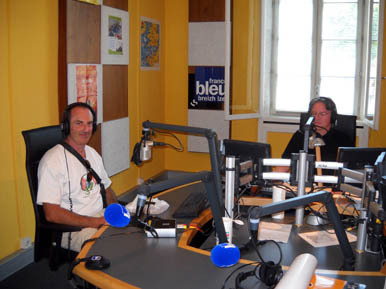 Saturday July 2, 2011, l'Expédition Scyllias was invited by the radio station France Bleu breizh izel. This day, the reporter Michel Pagès welcame Jean-Louis Maurette during the programme "Breizh au pluriel" ("Breizh in the plural") in order to talk during 45 minutes about the French-Tunisian underwater expedition which led to the localization and diving, on the 10th of June, of the wreck of the FFF submarine Narval. This was also a good opportunity to talk about the second part of the 'Narval' project about which l'Expédition Scyllias has been working since a few years, a magnificent project including the imersion of a commemorative stela on the wrecksite. A memory action which nevertheless needs a financial help. That is why we are requesting the help of sponsors or patrons who want to support this exciting project.